It was supposed to be a dream game for fans of strategy-role-playing games, but instead it became a disaster. 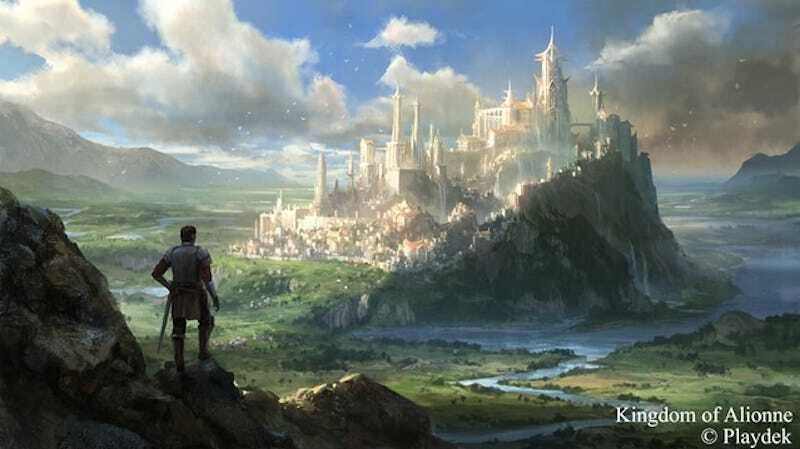 Unsung Story, which crowdfunded over $660,000 in 2014, is one of the biggest Kickstarter failures of all time. Let’s zoom out and look at the whole debacle, shall we? Last night, the company Playdek announced that it has bailed on Unsung Story, handing over the development rights to another company. It’s the culmination of nearly four years worth of shady behavior, broken promises, and wasted money. To give you a sense of just how big a failure Unsung Story has been, I’ve put together an entire timeline of events from the past four years. It’s pretty remarkable to see it all in one place. Let’s start from the beginning. September 18, 2013: Final Fantasy Tactics Yasumi Matsuno makes a grand announcement: alongside the board-game company Playdek, he will be developing two games in a universe called Unsung Story. One of those games will be a digital card game, and the other will be a strategy game. In a press release, Playdek says that both games will be out by the end of 2014. January 14, 2014: After staying quiet on the project for a while, Playdek makes another big announcement: they’re crowdfunding Unsung Story, with a goal of $600,000 on Kickstarter. It sounds like the dream game for Final Fantasy Tactics fans, promising to “re-imagine a classic game genre, as Yasumi Matsuno weaves together one of the complex and rich game worlds that he is known for, with inspiring class based tactics game play.” There’s no mention of the digital card game or, for that matter, anything about multiplayer. The estimated delivery is July, 2015. In the coming weeks, there’s some brief controversy over Unsung Story’s platforms and reward tiers—a controversy that Playdek addresses through backer updates—but for the most part, it all seems promising. Playdek is saying all of the right things. I back the game for $20. I tell them that I’d be happy to do the interview, but that I can’t let them dictate either the date or the format. Playdek’s PR company says they’ll get back to me. February 14, 2014: Unsung Story hits its crowdfunding target just a few hours before deadline, raising $660,126. In the coming weeks, Playdek’s community manager will post a series of mundane updates about the staff and other high-level details surrounding the game. March 21, 2014: A backer update: “We will continue with these weekly updates so you know we are still thinking of all of you, and it won’t be long before we will be able to share lots of content with you about Unsung Story! Great things are on their way!” In subsequent updates, Playdek talks about the digital card game it had mentioned in September 2013, much to backers’ dismay. Unsung Story’s Kickstarter had talked about a spiritual successor to Final Fantasy Tactics, not a card game. August, 2014: Playdek does not post any new updates. It’s the first of many promises that the company will break. September 5, 2014: Playdek posts an update, the first of three more throughout 2014. It’s all basic stuff, including some details on the story and gameplay of Unsung Story. Nothing worth much attention. February 20, 2015: Months of silence since the last update (November 2014) leave fans asking just what’s going on. A year after the conclusion of Unsung Story’s Kickstarter campaign, Playdek has not yet shown any gameplay, but in a new backer update, the company posts a handful of screenshots. They look... rough. Backers begin to wonder just where their money has gone. June, 2015: There are no updates. July, 2015: There are no updates. August, 2015: There are no updates. September 21, 2015: Joel Goodman, Playdek’s CEO, takes to Kickstarter with a dreary update, saying that progress on Unsung Story has moved more slowly than he’d hoped. It’s not clear why, just three months ago, the company told backers that development was “progressing nicely.” Goodman says that Playdek has been dealing with financial issues and that they’re looking into working with outside publishers. He also says that Unsung Story will be delayed to 2016. Then, Goodman casually outlines a development timeline for Unsung Story that will begin with a “PvP [Player vs. Player] beta release” in June 2016. This is the first time that the Unsung Story Kickstarter has ever mentioned the term “PvP.” Backers are alarmed. They gave $660,000 to Playdek because they wanted Yasumi Matsuno’s spiritual successor to Final Fantasy Tactics, not because they wanted a multiplayer game. Goodman later adds that an “entire single player experience will be rolled out to all backers,” but fans are beginning to lose faith that Unsung Story will ever happen. September 30, 2015: During an AMA on Reddit, one backer asks Joel Goodman if he has proof that there’s been development on Unsung Story. Goodman writes: “On the next major update we will have video footage of in-game gameplay and will go into more details on the UI development direction.” Goodman also makes it clear that Matsuno’s involvement with Unsung Story has already ended. October 20, 2015: Playdek posts an update with the video Goodman promised. It looks horrendous. “Next month we will have a more thorough video going over the specifics in combat,” the company says. November, 2015: There are no updates. December, 2015: There are no updates. January, 2016: There are no updates. It remains unclear where the Kickstarter money went. Playdek dodges questions on whether it will offer refunds to backers. February 27, 2016: In an optimistic update, Playdek says that it has been able to secure more funding and that it will have more information to share in March. March, 2016: There are no updates. May, 2016: There are no updates. July, 2016: There are no updates. August, 2016: There are no updates. January, 2017: It may shock you to hear that there are no updates. June 28, 2017: There is no news. It will take another month before Playdek updates its Kickstarter backers again. August 1, 2017: Playdek breaks its eight-month silence, telling backers that it has decided to jump ship. A game company called Little Orbit will take over development on Unsung Story. Little Orbit, a small company that was previously responsible for several licensed games involving properties like Barbie and Adventure Time, says it is starting from scratch on Unsung Story. Little Orbit CEO Matt Scott says the company is using Matsuno’s original designs but will be making a single-player game, not the multiplayer version of Unsung Story that Playdek had discussed. Scott tells Unsung Story backers that the company has not received any of the Kickstarter money. He also says that he did not pay “any significant amount” to Playdek. “We felt it was better for all involved if Playdek no longer had any attachment,” he says. It remains unclear what Playdek and Joel Goodman did with the $660,126 they raised on Kickstarter.